A Toronto-based identity management firm released a new product to securely access sensitive data from a Mac OS X or Windows-based computer, the company announced today. Route1 Inc. is releasing version 2.0 of its MobiKey device. At first appearance it looks like any regular USB device, but once you plug it into a PC, it becomes a multi-factor authentication security tool. It allows a user to access office files, data, and applications from an unsecured remote computer. It protects the sensitive data from the prying eyes of hackers by guarding against nasty malware and key loggers, and wiping any trace of the user session from the computer once it’s over. MobiNet’s authentication is user-based, not device-based. Although it’s a USB key, the user can’t store any data on it – so there’s no chance of a physical data leak if the device is lost. Administrators can also revoke the certificates associated with a lost key to ensure no one else uses it to gain access. 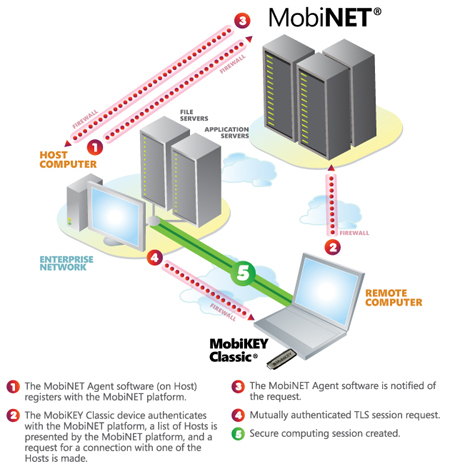 The MobiKey Classic2 isn’t a standalone product – it works with Route1’s MobiNet identity management platform. The firm takes a user-based approach to security, as opposed to a device-centric viewpoint. It combines the “something you know” password approach of security with the “something you have” approach in the MobiKey. Route1 counts the U.S. Department of Defense among its customers, an outfit with a pretty well-known reputation for high security standards.